I have a secret. I get a special and sometimes mysterious pleasure from breaking rules. I have learned to have an outward appearance of agreeability to retain my job, maintain my driver’s license and stay out of the pokie. But, in reality, I am sometimes looking for a rule to break. Occasionally, when people in authority look at me and tell me what needs to be done, I look them in the eye, I say okay, and I think…bugger off!!! Why? I wonder sometimes. I have contemplated the fact that it may be a personality flaw. I may have unresolved issues with my parents and have an undiagnosed case of Oppositional Defiant Disorder. But considering I can resist the impulse to flip the birdie to anyone who gives me an order, it must be something other than a diagnosable disorder. Aside from an occasional speeding ticket I am a law abiding citizen. I believe it’s important to show respect and consideration for others. I would never do anything to hurt anyone. But I do think it’s crucial to the spirit to break an occasional rule. Questioning authority and pushing the limits just means that you’re human and not a robot or an automaton. It keeps the people in charge on their toes. To follow the maze consistently for the purpose of getting the cheese at the end just makes you a really smart rattus rattus, Darling. You can have my cheese. So question authority. Break a few rules. Be a little wild. Ask “why?’ a whole lot more. It just means you’re alive. Not only that, but serious experts highly recommend it. Here are all eighteen rules for a happy life, or should I say… suggestions? 1. Take into account that great love and great achievements involve great risk. Risk is involved in every great opportunity in life. It it isn’t risky, then everyone would be doing, thus making it ordinary and not “great.” Separate yourself from the crowd as one who not only can take risks, but enjoys doing so. Certainty in life can only be so comforting until it gets boring. 2. When you lose, don’t lose the lesson. If you lose what you have learned not to do, you will be doomed to repeat it. More importantly, however, do not fear failure. Failure is the precursor to success. Hardly any great thing that you wish to accomplish will come without failure. This ties back to the rule of risk mentioned above. Respect for self – Confidence is key in success and one who does you respect himself does not believe in himself. Thus, if you do not respect yourself, you cannot possibly succeed in anything great, nor can you respect others. Respect for others – And you will be respected in return. Anyone who does not return that respect is immediately letting you know that they are not worth your time, and that they do not respect themselves. Avoid weak/insecure/self-loathing people. Responsibility for all your actions – You alone are responsible for your feelings, actions, success, etc. You are in complete control of your life, so do not try and blame other people for your mistakes or misfortunes. 4. Remember that not getting what you want is sometimes a wonderful stroke of luck. Not everything that you desire will be necessarily good for you in the long run. If something just seems to not work out continually, in such a way that it seems almost like fate intervened, consider letting it go or coming back to it at another time. The Universe works in mysterious ways and should be trusted. Just be sure you are not mistaking your own failure as the Universe telling you something. 5. Learn the rules so you know how to break them properly. Rules are meant to be broken. Most of them are put in place by archaic, corrupt institutions that seek only to enslave and maintain their own power. When it comes to breaking them, be sure to do it properly to avoid punishment. 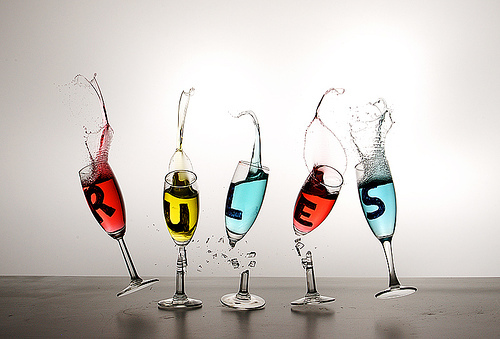 But above all things, make sure you DO in fact break rules. If authority was never questioned, we could be a stagnant civilization. 6. Don’t let a little dispute injure a great friendship. Obviously friendship is more important that one small fight, but very few people actually put this rule into practice. They also need to be able to follow rule #7 in order to truly follow #6. 7. When you realize you’ve made a mistake, take immediate steps to correct it.And do not let your pride get in the way of taking those steps. Apologize, taking full responsibility. That will speak for your character more strongly than the action of making the mistake in the first place. 8. Spend some time alone every day. No matter what you do, take at least 30 minutes out of your day to spend alone in a quiet place. This will give you at least a half-hour to examine what is going on in your life, to examine yourself and to figure out what you want. Whether it be through prayer, meditation, yoga or golf, this ritual is a must. The Law of Attraction is the best way to spend this time. 9. Open your arms to change, but don’t let go of your values. This world is constantly changing. If you are not open to change, then you are going to live a very miserable life. You, yourself, are going to change as well, but that does not mean that your values have to change as well. Welcome new places, new faces and new loves, but never change those core parts of you unless you have strong reasons to believe you were wrong to believe them in the first place. 10. Remember that silence is sometimes the best answer. Silence leads to relaxed contemplation during which emotions have less influence and logic can take over. For example, in an argument with a friend, remaining silent instead of retaliating with something anger-driven is more efficient in ending the argument faster and with less hurt for both parties. Or consider Gandhi, who took down the British Empire through silent, pacifistic behavior. Silence is a powerful tool that few choose to use over irrational action. Consider it next time you find yourself in a difficult situation. 11. Live a good, honourable life. Then when you get older and think back, you’ll be able to enjoy it a second time. You are going to have to live with your actions for the rest of your life, so save yourself the regret and anguish and live with honor now. Good things also come to good people. You will never be punished for acting with integrity, only rewarded. 12. A loving atmosphere in your home is the foundation for your life. This is the rule that you have the least amount of control over. Your family dynamic will ultimately determine your home atmosphere, but you can definitely help it along by showing your family that you love them. As in rule #3, if you respect (love) your family, they will provide you with respect and love in return. This rule comes to play again when starting a family. Inject love into your home. Make the walls glisten with endearment. That will set a solid foundation for the lives of your children. 13. In disagreements with loved ones, deal only with the current situation. Don’t bring up the past. The past is constant, unchanging. Bringing it up can only bring more pain to the current situation. This is a problem especially with loved ones because relationships with them go so far back into the past and are so fueled by emotion. Forgive any past actions and focus on the present. 14. Share your knowledge. It’s a way to achieve immortality. One learns so much just from living a lifetime. Share that knowledge with the people you come across, it can only help them in their journeys. Even more important, share your failures so that others will not repeat them. 15. Be gentle with the earth. The earth is where we live. So this should be obvious. Hurting the earth is hurting yourself and the futures of your children and loved ones. 16. Once a year As often as possible, go someplace you’ve never been before. Experience new places and new things. You might find yourself with someone or somewhere that makes you much happier than your previous circumstance. The Earth is so vast with unique and beautiful places, why wouldn’t you want to go explore them? 17. Remember that the best relationship is one in which your love for each other exceeds your need for each other. The opposite is a sign that the relationship should end. If you need someone more than you love them, it is a sign of dependency, not affection. Find someone where love is the dominant force and you will find yourself in a much more fulfilling relationship. 18. Judge your success by what you had to give up in order to get it. Success is not truly success if you had to compromise yourself or your loved ones in order to achieve it. Decide what you want. Design your ideal life and go for it. Do not let any part of that dream slip away or the rest of your life you will live in regret. Hollie Niblett is the Content Strategist at Maya Creative Group.